A parabolic dish of diameter 1.5 m with tripod stand and stove ring. Simple screw assembly of metal parts, but solar dish lining is fragile. The purpose of a solar cooker is to convert sunlight into heat energy to cook food. There are three main types of solar cookers: box, panel, and parabolic. Box cookers act more as an oven and store a large amount of heat while panels and parabolas reflect light directly onto the cooking surface. 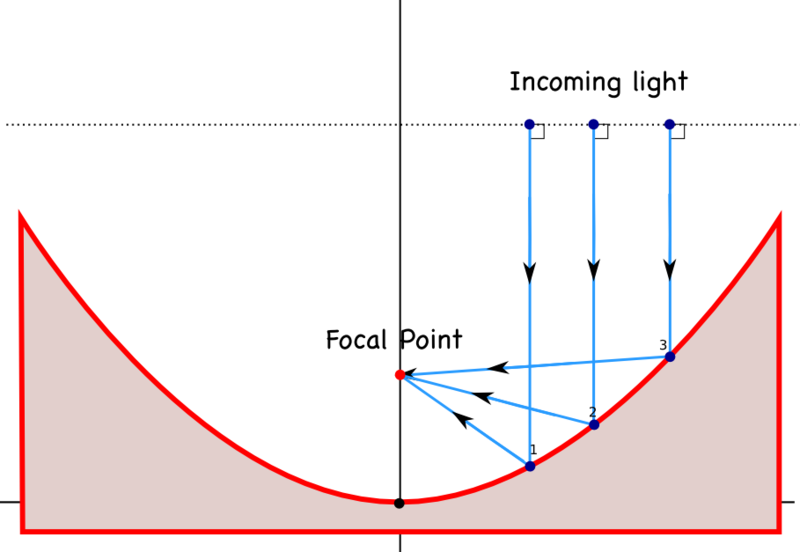 A parabolic reflector is one of the most efficient ways to harness sunlight; its unique shape concentrates all of the sunlight at one focal point (see diagram). This particular parabolic solar cooker is also useful because it has an expansion pipe which allows the angle of the reflective dish to be adjusted while cooking. It is also large enough to capture and concentrate enough sunlight to boil water in 10 minutes. Today, solar cookers are globally used and continue to grow in popularity. People are moving away from other fuel sources such as wood, coal, or natural gas because of their harmful by-products and unavailability. Solar cookers also remove a large burden on many poverty stricken areas by giving them a constant means of water purification, so long as the sun is up. Every day people find new ways to harness sunlight as a clean, renewable, and powerful source of energy. Diagnose any issues you may be having with your Solar Cooker using our Troubleshooting Guide.